Completely revamped & redesigned: Inspired by track racing, the Revel II sports motorcycle glove benefits from a complete facelift. 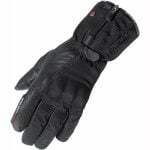 The goat skin construction offers unprecedented comfort whilst the Superfabric at the fingers and palm takes care of the abrasion resistance. This latest version boasts much more wrist protection thanks to a new and more substantial wrist, all without being restrictive!